IEC@OCC assists students as they adjust to their new life in the United States. Ask our staff if you have any questions! Here are guides to some of the more commonly asked questions. Cell phones: Download our Cell Phone Information sheet. Orange County: To learn more about life in Orange County, read the IEC@OCC Blog. 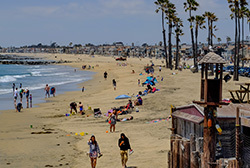 The Blog has suggestions for activities and excursions and lists of must-see places in OC! Orange Coast College: Get involved in your new campus! Learn how with our article How to Get Involved at OCC. Transportation: Download our Transportation Guide, read our Guide to Public Transportation article , or download and read our Driving in the USA information document. Make sure you meet all the requirements to keep your student visa in status. Download the Maintaining Status document for more information. Download the 2019 IEC@OCC Payment Form. All IEC@OCC students have health care. Visit the IEC@OCC Medical Insurance page for information about health care options and answers to health care FAQs. Students can also download the Health Care FAQs and the 2018-2019 IEC@OCC Anthem Health Plan guide. Download IEC@OCC’s instructions for printing the I-94 form. To print the I-94 Form, visit the I-94 Official Website. Download instructions for how to get a California driver’s license. Did you move? Download the Change of Address Form. The IEC@OCC Student Handbook contains useful information for IEC@OCC students, including important dates, classroom policies, information about our classes and levels of instruction, how to get a bank account in the U.S, and more. Visit IEC@OCC’s social media sites! IEC@OCC is located on the campus of Orange Coast College. After successfully completing courses at IEC@OCC, students who wish to attend college in the U.S. then continue with classes at Orange Coast College. Contact IEC@OCC for more information about attending classes at Orange Coast College and the transfer agreements OCC has with many colleges and universities. Download the IEC to OCC Guide for more information. Download the OCC Acceptance Checklist.